The best firestarting system can also be the cheapest and the materials are the easiest to find at any drug or grocery store.
. This Boy Scout Hot-Spark and a prescription bottle filled with cotton balls and petroleum jelly makes a reliable firestarting method that is cheap enough to be placed in all survival kits. After extensive testing, my nomination for the best overall survival firestarting method is cotton balls, slathered with petroleum jelly, combined with a magnesium or flint stick. I ran across this method several years ago at a Peter Kummerfeldt seminar at the Deschutes Fairground Sportsmen show. Kummerfeldt demonstrated the method at his booth, and it looked so easy, I figured there had to be a catch. So, I got the materials and tested it myself, then had some of the scouts from Boy Scout Troop 18 in Bend, OR. wring out the system. Everybody likes the system because of its reliability. There is nothing to break, it requires no fuel, and temperature has no affect. But an additional benefit is how cheap it is to produce! Here’s how you can make one of these firemaking kits. Get a locking cap, waterproof prescription bottle. These days, everybody has a prescription for something, and the meds usually come in a small, plastic pill bottle. The bottles with the snap-and-bayonet, waterproof top work very well for storing the cotton balls, and probably won’t cost anything. You can also use an empty 35mm film plastic container, or a standard waterproof matchbox. I use all of these containers, since I carry the cotton balls/petroleum jelly firestarter in all my survival kits. Just be careful with any snap-off or non-locking cap – if they’re easy to get off, they may come apart in your pack! Cotton balls: Get extra-large, 100 percent cotton. They generally cost less than a penny each. Petroleum jelly: I paid $1.99 for a 13-ounce jar at the local department store. Many of the lip balm sticks will also work with this system, so experiment at home. Flint or magnesium sticks come in different sizes. Find a size that is handy, so you’ll take it with you! The keychain size, center, is a good choice for everyday carry. Label with directions: Put a label on each container with what is inside, and how to use it. You may not need the reminder, but then again, you might be injured, disabled or unconscious, and someone else might have to build that life-saving fire. Make their job easier by including simple instructions. I use a standard Avery 5160 1″x2-5/8″ labels, with Wordperfect software in the “labels” dropdown. Use 11 point, Aerial type, and this spacing, and all the information fits nicely. These containers, filled with cotton balls and petroleum jelly, are fantastic promotional give-aways and cost pennies. 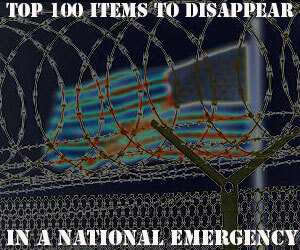 Scouts can make up a bunch, and give them out at their next campout or public gathering. 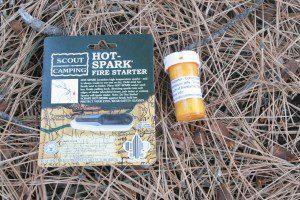 I give the containers out when I go cross-country skiing or snowshoeing as a public service – it’s scary how often this firestarter is the only survival gear some people have! Total cost of the complete firestarter kit, with Hot-Spark, is about $2.75 to $3! If you opt to buy a waterproof match container for the cotton balls, that will set you back another $2-$3. You’re still looking at a complete firemaking system for about five bucks! Carry this combination in all your survival kits. When you need to make a fire, pull out a pinch, fluff it out and strike a spark onto the cotton ball with the flint stick. If the wood is damp, and the tinder in short supply, use a whole cotton ball. My experiments show that a cotton ball gobbed with petroleum jelly will burn for several minutes. The cotton balls and petroleum jelly have another use. On a Boy Scout 50-miler hike a few years back, I started to get a blister on my heel. I took out my cotton ball firestarter, and rubbed the hot spot with the petroleum jelly. No blister formed! When it comes to your survival kit, you decide how much you want to invest. Personally, I want the best equipment available for me and my family, and price is not a consideration. Our lives are worth that to me. Use common sense in all of this. Find the best, most reliable systems for your survival kits, then practice, research and decide how they can best serve you. Find the most effective fire ignition system. Use charcloth as an effective method of catching a spark to make a fire.